This is book can be read as a stand alone but you will miss out on some of the character development and details which occurred in book 1. I really like that the heroine in this book isn’t completely helpless (even though she gives that impression at the very beginning). Kaylee is a strong character, even when she doesn’t want to be. I loved Hugh, he and his partners (Theo and Otto) have hilarious interactions. There was plenty of action in this story. I am really not sure Hugh can take any more damage, so I hope the next book goes a little easier on him! We also get plenty of catching up with Jules and the kids (book 1) without completely overwhelming the plot. 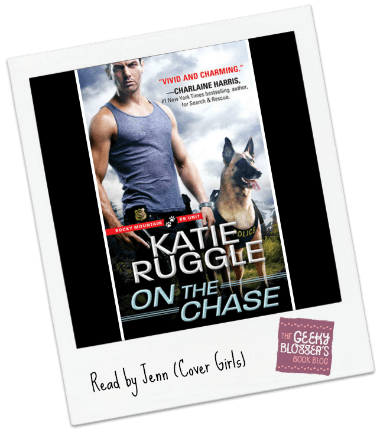 As with Katie’s previous series (Search & Rescue) there is a thread which carries through all of the books. Towards that end, there was no progress in this book. Can’t wait for the next! Callie was really good with all the female parts and her pacing was really on point. Her male voices were not my favorite but they were not distracting. It was overall a solid performance and I would listen to the narrator again. I’ve been wanting to try this series/author and she just had a freebie on Kindle so I dl’d it. PUPPY! You know that is what got my attention. Well, that and the hunk on the cover… 😉 I do need to try this author. I may have to start with this series. This does sound like a lovely book, but I will keep in mind to read this series in order. Great review hun.